Yes indeedy, it is that time again! School has been hectic, and I just decided today to participate. In the end…I just couldn’t imagine skipping it. Way too much fun to pass up! I’m definitely going with TBR books that are not for review…just things I’ve had to put off in order to read ARCs. I’m really excited to finally have a go on some of the things from my personal stash! Can’t wait to see how everyone else does tomorrow…if you’re participating feel free to leave a link and I’ll send some encouragement your way! And a Merry Read-a-thon to you! This is my first read-a-thon and I'm so excited! Your stack looks awesome! I'm so glad you are participating! Hooray! 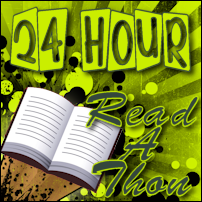 Have fun doing the readathon! I have tons of plans for today with family in town otherwise I would join in the fun myself! Hey! Making cheerleading rounds of the blogs I follow participating. Good luck and happy reading!! Hope you get lots of reading done! Next post: Readathon Mini-Challenge: Name That Book!